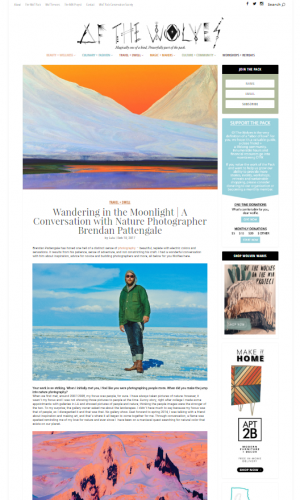 Brendan Pattengale has honed one hell of a distinct sense of photography – beautiful, replete with electric colors and sensations. It results from his patience, sense of adventure, and not constricting his craft. I had a wonderful conversation with him about inspiration, advice for novice and budding photographers and more, all below for you Wolfies here. Your work is so striking. When I initially met you, I feel like you were photographing people more. When did you make the jump into nature photography? When we first met, around 2007/2008, my focus was people, for sure. I have always taken pictures of nature; however, it wasn’t my focus and I was not showing those pictures to people at the time. Funny story, right after college I made some appointments with galleries in LA and showed pictures of people and nature, thinking the people images were the stronger of the two. To my surprise, the gallery owner asked me about the landscapes. I didn’t have much to say because my focus was that of people, so I disregarded it and that was that. No gallery show. Fast forward to spring 2014, I was talking with a friend about inspiration and making art, and that’s where it all began to come together for me. Through conversation, a flame was sparked reminding me of my love for nature and ever since I have been on a maniacal quest searching for natural color that exists on our planet. Your pieces have this incredible painted quality to them. What’s the process like for you – from taking the photograph to landing at your final product? The process is quite simple. I pick places around the world that have interesting geological features and color, immerse myself in that environment, and wait for the Earth to reveal itself. I wake up for a sunrise, I’ll wander out on a full moon, I try to give myself the luxury of finding a landscape and sit and wait there, observing it in all its light shifts from day to night. The process is all about research beforehand, immense travel, and patience. It depends what music I’m listening to, or who else is around me as well. If you want to talk about technical process – it’s about how I see color, how I use imagination, and how I make a photograph. I like to employ what I call color contrast in an image. We traditionally think about contrast as a light to dark ratio; however ,I like to create that depth using color, typically a warm to cool kind of thing. Having the freedom to sit, watch and observe allows me to make a conscious decision when that moment comes to push the shutter. I feel I’m out there to bring something back, so I better have a good reason for what I land on and I must have gone through all possible scenarios to bring back the best and most true representation of the place I have visited. Where do you find inspiration for your work? And more importantly on days when you aren’t feeling inspired, how do you get back in your flow? I find inspiration for my work in many different ways. First of all, I am inspired by nature’s sheer grandeur and beauty – the fact that certain places heighten human emotion and sensory impulses. When out in nature, I feel a pure insignificance compared to what my eyes feast upon, this idea that us human beings are all part of a bigger piece of the pie. For example, I came across a bright red lake in the middle of nowhere Bolivia, and all of a sudden the world stopped, My eyes couldn’t believe what they were seeing. I was hearing the distant sounds of flamingos frolicking below – my heart beat fast – I could feel the blood coursing through my veins. The sight of this red lake took over my entire body and being. Once I had experienced that, I knew I was on the right path and have been searching for that same sensation ever since. Besides nature, I am inspired by other artists. My favorite right now is a contemporary Irish painter out of Brooklyn, Genvieve Figgis. I’m also really digging the sculpture work of the Haas Brothers. They are on to some next level form of expression. Music is incredibly inspiring to me, mainly 70s-80s reggae/dancehall. I don’t know.. life is pretty inspiring, all of it. On days I’m not feeling inspired, I get back in my flow by going on a walk, or I pick up the paintbrushes and start painting. For me, I don’t have an on or off switch. I’m either in the zone to create or not, with no control over either scenario. Walks help get me back in my flow because it allows all the negative thoughts to come to the surface, and there is ample time to set those negative thoughts free. It’s the same with painting for me. I paint in order to set my mind free. I am not trying to paint a masterpiece, and my paintings are just for myself so there is no pressure there, just pure exercise. Painting is great because it hones my form of composition, color, and light – something that is ever important in making photographs. What advice do you have for photographers who are just beginning to hone their craft? My advice for beginning photographers is to take pictures they like, and to keep taking the same picture over and over again in varying conditions. The key is to keep taking pictures you like, and over time a narrative will begin to create itself. Some more advice is to not get bogged down with trying to obtain a perfect image, make mistakes, take risks, push the boundaries, follow your vision. You have a show coming up in Los Angeles. Tell me about that! Yes, very excited about this. I have a show opening up Thursday February 16th at Fahey/Klein Gallery here in Los Angeles. The show is called “Young Bloods.” It’s a show all about color, where I am one of four young-ish photographers who will be exhibiting. I will show alongside Chad Pittman, Cope-Arnold, and Torkil Gnudason.